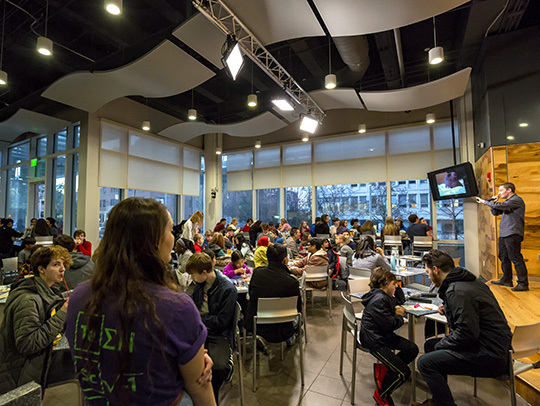 Teen Science Cafés bring teens together in an informal setting to learn about science and technology. Each café will include a scientist presentation, an interactive activity relating to the discussion, a Q&A session, and time to meet other teens that enjoy science. This program is recommended for participants ages 11–17. The first 50 teens to arrive will receive a voucher for a free meal. This is a FREE event. No registration needed! Can’t make it to the Café? Don’t worry! All of the Teen Science Cafes will be broadcast on Facebook. Tune in on the day of the Café and participate from anywhere! Download activity worksheets from the Upcoming Cafés event pages and participate in Q&A right from Facebook. To view past cafes, check out our video archive. If you would like to attend a Teen Science Café and live in southeastern North Carolina, our Whiteville branch has you covered! Teen Science Cafes are held in Whiteville on the third Friday of each month from 5–6:30 pm. This nationwide program is funded by a grant from the Burroughs-Wellcome Fund. The North Carolina network partners include the North Carolina Museum of Natural Sciences, Morehead Planetarium and the North Carolina Museum of Natural Sciences, Whiteville.